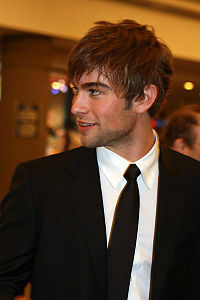 Ο Κρίστοφερ Τσέις Κρόφορντ (αγγλικά: Christopher Chace Crawford, 18 Ιουλίου 1985) είναι Αμερικανός ηθοποιός. 2009 Seth MacFarlane's Cavalcade of Cartoon Comedy Record store clerk (voice) Episode: "Things You Never Hear"
2009 Robot Chicken John Connor, son (voice) Episode: "Cannot Be Erased, So Sorry"
2014 Glee Biff McIntosh Episode: "100"
↑ 1,0 1,1 «2008 Teen Choice Awards Nominees & Winners». About.com. 2008. Ανακτήθηκε στις August 8, 2011. ↑ Carroll, Larry (August 10, 2009). «'Twilight,' Britney Spears Big Winners At The Teen Choice Awards». MTV News. Ανακτήθηκε στις June 7, 2012. ↑ «Teen Choice Awards 2009 nominees». Los Angeles Times. June 15, 2009. Ανακτήθηκε στις June 7, 2012. ↑ «2010 Teen Choice Awards Winners List». MTV News. August 9, 2010. Ανακτήθηκε στις August 8, 2011. ↑ «People's Choice Awards 2011 Nominees». People's Choice Awards. 2011. Ανακτήθηκε στις August 10, 2011. ↑ Slezak, Michael (August 8, 2011). «Teen Choice Awards: Three Best Moments, Worst Speech, and Full TV Winners List». TVLine. Ανακτήθηκε στις December 28, 2012. ↑ Ng, Philiana (June 14, 2012). «Teen Choice Awards 2012: 'Breaking Dawn,' 'Snow White' Lead Second Wave of Nominees». The Hollywood Reporter. Prometheus Global Media. Ανακτήθηκε στις June 14, 2012. Τελευταία τροποποίηση 12:29, 13 Μαΐου 2017.